Brothman, a secret member of the Communist Party of the United States (CPUSA), became a member of a Soviet spy network run by Jacob Golos. His codename was Constructor (later Expert). According to Kathryn S. Olmsted, the author of Red Spy Queen (2002), Golos handed Brothman over to Elizabeth Bentley: "Her first assignment in her new role as courier, secret agent, and Girl Friday was to handle an irascible and annoying industrial scientist. Abe Brothman, a New York engineer, had designed a mixing machine for chemicals. He periodically met with Golos to pass along blueprints for this invention and other new industrial processes. The blueprints were Brothman's personal property, so he hardly qualified as a major spy at this point in his career. Golos's long-term plan, though, was to develop the engineer as a future source of industrial secrets. Because of his girth and waddle, Elizabeth dubbed Brothman the Penguin. Beginning in the spring of 1940, she began to meet with him regularly. They would rendezvous on the street, then proceed to dinner. In the course of the dinner, Brothman would hand her an envelope full of blueprints." (7) In 1941 Harry Gold became his main source of contact. (4) As a result of his activities Brothman's company was commissioned to do work for the Soviet Government Purchasing Commission in New York City. When Kim Philby told the NKVD that Elizabeth Bentley had provided the names of Soviet spies, Anatoli Yatskov was ordered to break-off all contact with his agents. However, on 19th December, 1945, he did have a meeting with Harry Gold, who warned him that a member of his network, Abraham Brothman, had already been interviewed by the FBI. Gold insisted that Brothman knew him as "Frank Kessler" and did not know his address: "I said that in case (Brothman) confessed about (Gold's) existence and described... what he knew about him, the FBI would try to find him. (Gold) should know that these links to him come only from (Brothman) and must not worry, since the (FBI) knows nothing about him and his work... However, (Gold) must be on the alert and demonstrate tenfold prudence and attentiveness in everything." (9). When the FBI interviewed Abraham Brothman he admitted knowing Elizabeth Bentley. He also mentioned that he knew Gold. As Kathryn S. Olmsted, the author of Red Spy Queen (2002), has pointed out: The name of this mysterious chemist was new to the bureau. Although the FBI's investigation of him did not turn up any evidence of espionage at the time, the bureau added Harry Gold's file to its collection of potential Soviet spies." (10) In May 1946, Gold went to work for Brothman. 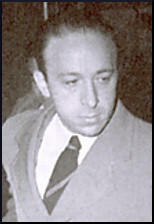 Anatoli Yatskov did not see Harry Gold again until 26th December, 1946. 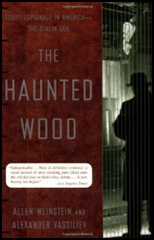 As Allen Weinstein, the author of The Hunted Wood: Soviet Espionage in America (1999): "Yatskov had not seen Gold for an entire year. By the time they concluded their conversations, the Soviet operative undoubtedly regretted his neglect. Gold had been fired from his job as a chemist at a sugar plant in March 1946 when the company laid off a number of employees because of business losses. He remained unemployed until May, when Abe Brothman hired him as a chief chemist in his company. In short, the NKGB's chief courier in America now worked daily for one of his own leading sources!" (11) Yatskov also discovered that Gold had become a close friend of Brothman and had told him his real name and address. Yatskov was outraged and rebuked Gold angrily for having violated all the rules of spying. In May 1947, Abraham Brothman was called before a federal grand jury and shown a photo of Harry Gold and Jacob Golos. Although the prosecutor overseeing the grand jury told Brothman they knew "everything about their covert activities and urged him to confess, the engineer denied any involvement with Golos's work and claimed to have met him only once or twice. When asked who had introduced him to Golos, Brothman named Gold. Following Brothman's grand jury appearance, two FBI agents visited him, and asked him about his former employer. Gold denied that he was part of a Soviet spy network. 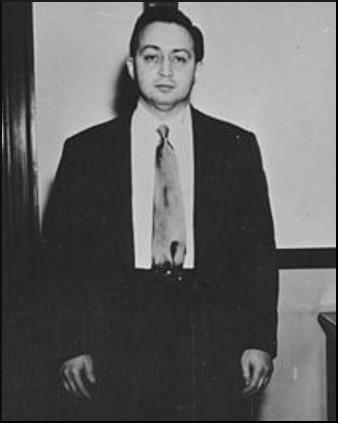 On 16th June, 1950, David Greenglass was arrested. The New York Tribune quoted him as saying: "I felt it was gross negligence on the part of the United States not to give Russia the information about the atom bomb because he was an ally." (18) According to the New York Times, while waiting to be arraigned, "Greenglass appeared unconcerned, laughing and joking with an FBI agent. When he appeared before Commissioner McDonald... he paid more attention to reporters' notes than to the proceedings." (19) Greenglass's attorney said that he had considered suicide after hearing of Gold's arrest. He was also held on $1000,000 bail. Gold admitted that he went to work as chief chemist for Abraham Brothman in May 1946. He was promised the possibility of becoming a partner. However, the company was not profitable. Gold commented: "When there was no money, I was a partner. When there was money, I became an employee." Gold claimed that he was owed $4,000 in back salary when he left the company. Gold was eventually sacked and Brothman changed the locks to keep him out. Brothman and Moskowitz did not testify on their own behalf. Moskowitz argued that the reason for this was they did not want to expose the fact that they were having an affair. “He was married. I had no right to do that. And I was overcome, I guess, with humiliation that I had ever let myself get into that.” (34) The jury was not impressed by this decision and after deliberating for three hours and fifty minutes, the jury found both defendants guilty. Abraham Brothman died in 1980. Abe Brothman was a chemical engineer who had worked for a design and equipment manufacturer in New York City in the late 1930s and early 40s. Part of his income accrued through sales commissions. The firm advertised in trade and professional journals and it was through such means, Abe had told the FBI, that a man called on him in early 1940 who said he had business connections with the Russian Amtorg Trade Commission in New York. The man's name was John Golos; in return for his obtaining business from Amtorg he and Abe agreed that he would be paid the usual finder's fee of ten percent. Abe welcomed his offer; he had previously tried to interest the Russians in doing business with him but could never get past their reception desk. Abe would dictate explanatory notes on his material to Helen because he was unwilling to devote excessive time to uncertain, random sales by preparing these notes himself. He quickly found this arrangement unsatisfactory so he asked Golos to send him someone with a technical background who would understand his verbal descriptions of the material he was submitting. In the fall of 1941 a chemist by the name of Frank Kessler took Helen's place and the two men met sporadically thereafter. No business resulted from this and the Golos/Helen contact seemed to lapse. However, Abe found it useful to employ Kessler from time to time as a freelancer when his engineering work required chemical analyses. He had no chemical laboratory and Frank had the use of the one which employed him in Philadelphia. It was a mutually beneficial business arrangement; Abe gained the professional services of a chemist when he needed it, and the chemist gained extra income. Whenever Abe needed to contact Kessler he used a mail drop Kessler had given him in care of one Harry Gold. Eager to keep the Amtorg possibility alive and needing the chemist's services Abe did not question this. In August 1944, Abe set up his own consulting engineering business in midtown Manhattan with several other engineers as nominal partners. In October I came to work for him. The following year Abe opened a chemical laboratory in Elmhurst, Queens. He needed a chief chemist and offered the job to Kessler. The wartime shortage of civilian labor, particularly technically trained people, had lingered into the postwar era and qualified technical personnel were not easily obtainable. He joined a large chemical equipment manufacturer in Pittsburgh as a chemical engineer. In a matter of months he became chief engineer; he was now barely twenty-one. His career there and subsequently with other companies was marked by strife. The issues usually involved salary disputes, but there were also his quarrels about the jesting epithets used by some of his colleagues: "Brothman, the Jewboy genius." He was scrappy about anti-Semitism and called them on it repeatedly. It would be inevitable that Abe would want to set up his own operation as a consulting engineer so that he could exercise greater control over his professional life. He was nothing if not self-confident about his ability to build such a business even without adequate capitalization. He wanted the freedom to create without the strictures of moribund corporate vision, but he had family and staff responsibilities he was not able to meet after he set up his consulting office. In 1946 Abe made me a partner in the business so that I would one day recoup financially for having foregone a regular salary when the coffers were low. He made similar commitments to others, in desperation, but he failed to tell me. Ultimately this created confusing and sometimes strained relations between the others and me because I never understood the special claims they seemed to have on him. He sold rights to patents he owned to raise funds, but those funds did not last long. Eternally optimistic, he had no hesitancy to borrow money to keep the business afloat, not from banks but from individuals who believed in him. My father was one. Unquestionably, he meant to repay those debts but he never achieved the financial stability to do so. Yet he continued to go deeper into debt instead of setting limits on the scope of his operation or retrenching, or ending them altogether and becoming a salaried employee again. Her first assignment in her new role as courier, secret agent, and Girl Friday was to handle an irascible and annoying industrial scientist. Abe Brothman, a New York engineer, had designed a mixing machine for chemicals. He periodically met with Golos to pass along blueprints for this invention and other new industrial processes. The blueprints were Brothman's personal property, so he hardly qualified as a major spy at this point in his career. Golos's long-term plan, though, was to develop the engineer as a future source of industrial secrets. Because of his girth and waddle, Elizabeth dubbed Brothman "the Penguin." Beginning in the spring of 1940, she began to meet with him regularly. They would rendezvous on the street, then proceed to dinner. In the course of the dinner, Brothman would hand her an envelope full of blueprints . Elizabeth found the work boring and her contact difficult. So she was pleased in the fall of 1940 when Golos told her that he was "somewhat discouraged" with the Penguin and the quality of his information. The Soviets were planning to turn him over to someone else. Brothman's new controller was a Philadelphia chemist, spy, and pathological liar named Harry Gold. Gold had such a talent for espionage that the Soviets used him as a courier for several sources. Some, like Brothman, would become skilled industrial spies; others, like Sergeant David Greenglass, who was stationed in the machine shop in Los Alamos, had access to top-secret military information. Gold's most important contact, though, was the Russians' prized spy, British atomic scientist Klaus Fuchs. 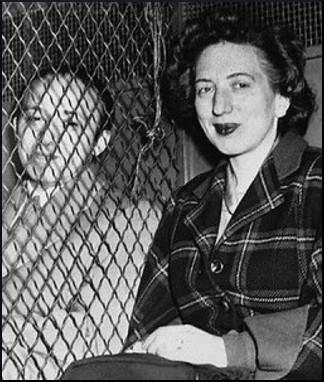 In 1945, when Elizabeth gave Brothman's name to the FBI, she would help agents uncover the trail that led from Brothman to Gold to David Greenglass-and eventually to Julius Rosenberg. When Julius and his wife, Ethel, were later tried for the "crime of the century," Elizabeth Bentley would be a key witness for the prosecution. Yatskov had not seen Gold for an entire year. By the time they concluded their conversations, the Soviet operative undoubtedly regretted his neglect. Gold had been fired from his job as a chemist at a sugar plant in March 1946 when the company laid off a number of employees because of business losses. He remained unemployed until May, when Abe Brothman hired him as a chief chemist in his company. In short, the NKGB's chief courier in America now worked daily for one of his own leading sources! On Saturday morning, July 29, a little more than a week after he had pleaded guilty to conspiring with Klaus Fuchs, Harry Gold was rushed from Philadelphia to New York to appear before a hastily convened federal grand jury. He testified for a number of hours and, according to the Times, looked "the picture of utter dejection when he left the grand jury room and was taken to Mr. Saypol's office." Later that same afternoon, the FBI announced arrests number five and six: Harry Gold's former New York City employer, Abraham Brothman, a thirty-six-year-old chemical engineer, and Brothman's business associate, Miriam Moskowitz, thirty-four. Headlined the Times: "New Spy Round-Up Brings 2 Arrests; Others Due Soon." Time magazine described the pair as "two more links in the Soviet atomic spy chain which the U.S. started to unreel early this year after the arrest of the British atomic scientist, Dr. Klaus Fuchs. 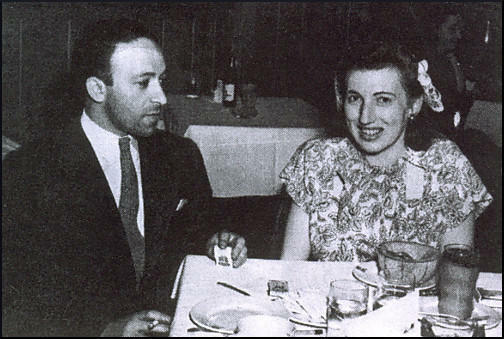 While no information regarding Miss Moskowitz's alleged involvement in the spy ring was available, Brothman was revealed to have been named earlier by Elizabeth Bentley, self-confessed Soviet espionage courier, as a person who had supplied her with blueprints and other information. Curiously, despite these extra-legal accusations, neither Brothman nor Miss Moskowitz was indicted for espionage. They were charged by the grand jury-which acted on the last possible day before a three-year statute of limitations would have made prosecution impossible-with the far less serious offense of conspiracy to obstruct justice. Each pleaded innocent and was held in $25,000 bail. Soon after, Miss Moskowitz's attorney tried unsuccessfully to have her bail reduced to $1,000, reportedly asserting that the case had been presented to the public in "a grossly exaggerated and misleading fashion." On July 29 it would be Harry Gold's former employer Abraham Brothman's turn, along with Miriam Moskowitz, his associate and mistress, to go behind bars. 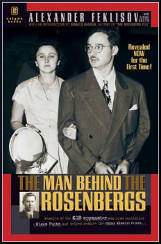 Neither one had anything to do with atomic espionage nor even with the Rosenberg network. Brothman, code named Konstruktor and subsequently Expert, had worked for the INO but had only provided the results of his own research, which had no military value... As for Miriam Moskowitz, while she knew of her lover's secret activities, she had taken no part in them.